Neutron by Behringer was a pretty good value for money before this update, and with version 2.0, Neutron got quite a lot better. 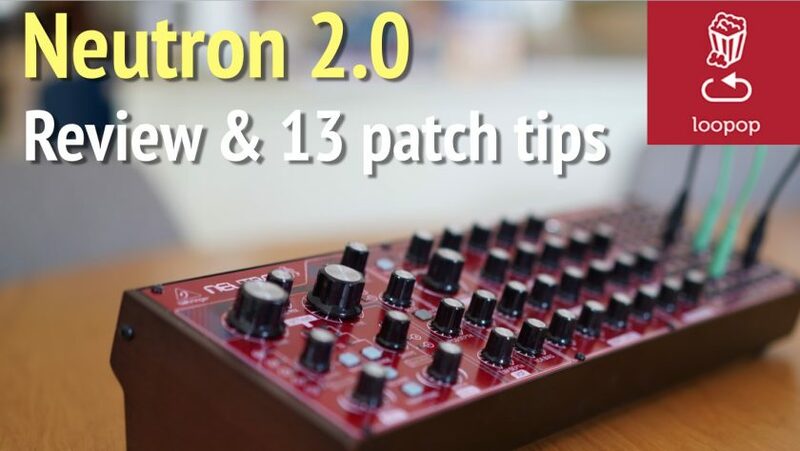 In this video I cover the pros, cons and important new features in Neutron firmware version 2.0. The new firmware has important improvements to Neutron’s paraphonic playability and options, LFO and more. It also supports Behringer’s new Neutron control software, which makes accessing its “shift” features substantially easier, gives bi-directional feedback to parameter status and tuning, and controls other parameters not configurable in the panel. Tip #1: Neutron’s overdrive and delay circuits can change your sound from a subtle to substantial way. You can bypass components in the signal chain by patching around them in the patch bay. Tip #3: Neutron’s tuning knobs are quite sensitive. Tune the oscillators to interesting intervals using the control software and use the mix knob to vary the balance or fade between them different tunings for creative effect. Tip #4: Use a precisely attenuated and tuned Square LFO to create a simple two note sequence. Tip #5: Don’t be afraid to rearrange the knobs… I think the filter cutoff knob should have been bigger and that the oscillator frequency knobs are too big and easy to hit by mistake. Luckily, it’s quite easy to rearrange the knobs to whatever works for you. Tip #6: By default, paraphonic mode is hard to use consistently because you don’t have control over which oscillator gets played next. Set note priority to low in paraphonic mode to help mitigate that problem. Tip #7: Sum the two filter outputs to create new filters… for example, a summed lowpass and high pass filters make a notch filter, and with increased resonance, it’s possible to create a subtle peak filter. Tip #8: While not the best way to create a stereo filter, since Neutron has two filter outputs with different filter types in each, you can use the two filter outputs for an interesting stereo filter effect. For example, route a band pass filter to the left speaker and a low pass to the right. Tip #9: Neutron’s envelopes are quite snappy. Make bassy kicks with a fast resonant filter decay modulation. Tip #10: You can change the shape and phase for each of the 5 shape slots in the LFO. Creative shape and phase morphing can create quite interesting rhythmic results. Check out the companion video for an example. Tip #11: Create a flanger with slow subtle delay time sine LFO modulation . Tip #12: Use velocity, aftertouch and the mod wheel in your patches!! They’re available as mod sources so make sure you map them to something interesting and use them when you play. Tip #13: Quite a number of faceplate/overlay manufacturers have popped up with alternate Neutron overlays. Regardless of the color, makes sure you get an overlay with the new 2.0 “shift” features. Thanks , see u .